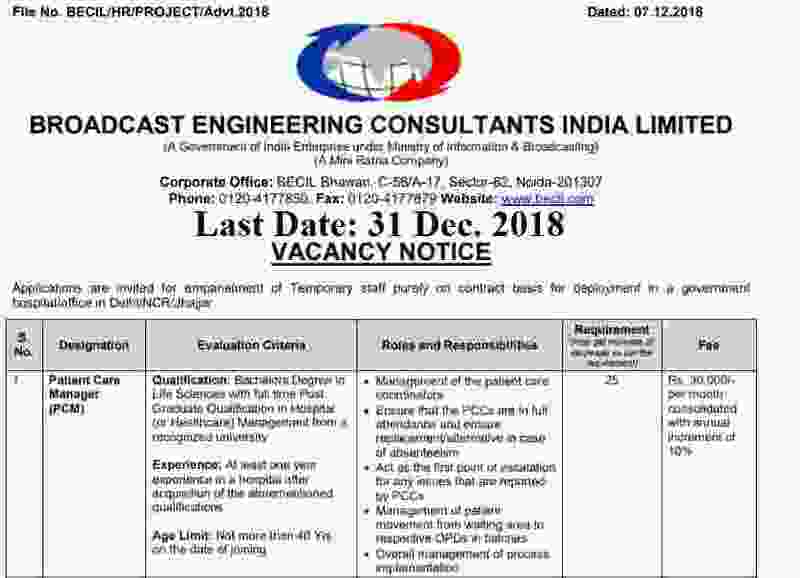 BECIL is stands for “Broadcast engineering consultants India Limited” is going to recruit for various job profiles. There are total 50 vacancies for two job profiles which are going to be filled up through this BECIL Recruitment process 2019. BECIL Recruitment department is looking to filled up the vacant positions of Patient Care Manager and Patient Care Coordinators. An official notification has been published by BECIL Recruitment department on their official website related to this recruitment procedure.More information related to these Government jobs is given below in this article. Read the whole article carefully before applying these Government jobs. We try to explain each and every prospective related to this recruitment in this article. SO read it carefully till end for more information. Educational Criteria: Applicants who have a Bachelor Degree/Graduation degree in Life Science, Post-Graduation degree in Hospital Management with 01 year experience can apply for this job profile. Age Bond: Must have age less than 40 years for Applying. Education: Graduation degree in Life Sciences subject with 1 year experience can apply. Age Bond: Must have age less than 35 years for applying this BECIL Recruitment 2019. Paying Method: Pay the Examination Fee through Demand draft drawn in favor of BECIL payable at New Delhi.